Recorded/performed at: Potton Hall, Dunwich, Suffolk, England, on Mar 03. 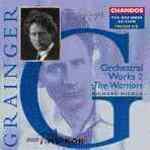 Percy Grainger Penelope Thwaites 1 mins, 17 sec. Contents note: Youthful suite -- Molly on the shore -- Irish tune from County Derry -- Shepherd's hey! -- Country gardens (Version 4) -- Early one morning -- Handel in the Strand -- Mock morris -- Dreamery -- The warriors. This product forms part of the following series: Grainger Edition (volume 6). Booklet includes programme notes and biographical notes on performers (in English, German and French). Performers: BBC Philharmonic ; Richard Hickox (conductor) ; Andrew Orton (leader). Capture session: Recorded at New Broadcasting House, Manchester, U.K., 27-28 April 1997. Score: Irish tune from County Derry : set for unaccompanied mixed chorus / by Percy Aldridge Grainger.